He lost his father, sea-captain Hugh Miller, in a shipwreck when he was only five years old (1807), and his two sisters a few years later. His widowed mother sewed funeral shrouds to put food on the table. A wild boy who frequently played truant, he had the inestimable support in his education of two uncles. From 1817 onwards, he would toil for 17 years as a journeyman stonemason. After making an initial impression as a writer with articles on Cromarty affairs for the Inverness Courier, (1829 - c.1835) and a poetry volume, Miller first gained national attention with his epic book of folklore collected from the Cromarty firesides of friends and family. Scenes and Legends of the North of Scotland (1834) is a masterpiece in a canon inspired by such luminaries as Walter Scott and James Hogg. While toiling as a jobbing mason, Miller absorbed Christianity of the evangelical type, and religion would come to dominate the second half of his life. The turning point on this came when he wrote his Open Letter to Lord Brougham (1839) challenging the abuses in Church of Scotland ministry, such as patronage. This led to his appointment as the editor of the reformers’ newspaper, The Witness. He helped to found a new Presbyterian Church, and gave it its name, the Free Church of Scotland. He gained a deserved reputation for the ferocity of his polemics, both on kirk matters, and on terrible injustices, such as the Highland Clearances and the conditions of the industrial working classes. For all his ferocity in print, he was shy, introverted, and prone to depression. He avoided the company of “the great and the good,” and ended up a rather isolated figure after falling out with powerful figures in the Free Church, although he spoke to a mass audience who read his newspaper. Miller developed his lifelong fascination with natural history initially as an almost entirely self-taught amateur geologist. His discoveries of Devonian fossil fish described in The Old Red Sandstone (1841) and Footprints of the Creator (1847) elevated him into the front rank among the natural scientists of his time. He won pre-eminence as a populariser of this then new science, with his wonderful powers of description. 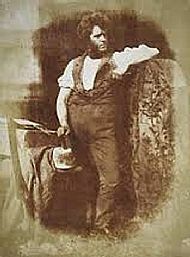 His geological output, originally published as pamphlets and in The Witness, was posthumously published as Testimony of the Rocks (1857), The Cruise of the Betsey (1858) and Sketchbook of Popular Geology (1859). These also became bestsellers, and were reprinted in many editions for some 50 years after his death. For a fuller bibliography, see the list on the website www.hughmiller.org. His fossil collection of over 6,000 specimens formed the founding core of what is today's Scottish national collection in the National Museums of Scotland. Some of his and other collectors’ outstanding specimens can be seen in the Beginnings gallery, situated in the basement of the NMS tower on Chambers St, Edinburgh. In his last years, intense overwork, combined with the silicosis which had plagued his lungs since his youthful toils as a stonemason, progressively undermined his health. In his final days he underwent torments of acute pains in his brain, and terror of madness. He died by his own hand - a single shot in the chest - in the early hours of Christmas Eve 1856, at his home in Shrub Mount, Portobello, just outside Edinburgh. He was deemed to have acted on “an impulse of insanity” and given a Christian burial in one of the biggest funeral ceremonies Edinburgh had ever seen. 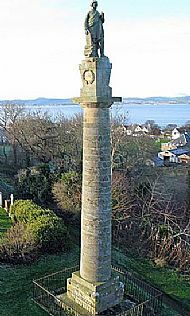 (Left, Hugh Miller Monument, Cromarty). 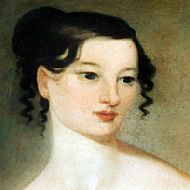 His wife Lydia had been his steadfast supporter through all his endeavours and struggles. As his widow, despite prolonged ill health, Lydia edited and secured posthumous publication of several of his books, simultaneously bringing out a series of best-selling children’s fiction. The sales helped her to look after their four children, Harriet, William, Bessie, and Hugh Junior. She died nearly 20 years after Hugh, on 11th March 1876, at the home in Assynt of Bessie. The couple are both buried in The Grange Cemetery, Beaufort Road, Edinburgh, about one and a half miles south of the city centre.